One humidity and temperature sensor. Humidity 5 ~ 95% RH. Humidity ±5%. Humidity 10 ~ 90% RH without dew. Temperature -20 ~ 60℃. Temperature ±1%. Temperature -20 ~ 45℃. Case materials: PC ABS, fire proof. Suitable for hatching all sorts of eggs, such as chicken eggs, duck eggs, goose eggs, baby pigeon eggs, quail eggs, etc. - The translucent outer surface gives you a visibility to monitor the hatching process. 1 x Incubator. ensure that there is sufficient oxygen in the incubator. of the number of eggs(the incubator can contain 32pcs eggs.). -- Multi-type egg hatching: eggs, duck eggs, goose eggs, bird eggs, ect. This tray will fit for Incubato or similar type incubator. The Universal tray can house:32 Quail eggs or 32 Chicken size eggs and all sized eggs. Note:Can not put the duck egg/ goose egg /peacock eggs. Step 2: After receiving the incubator, lay the lower heating mat flat. Place the filled water bag on the heating pad. The opening of the water bag is fixed on the foam box next to the incubator with a clip to prevent water from spilling out. , where the eggs do not touch the substrate, but are suspended above it with the tray. This allows for great air circulation and improves hatch rates. Suitable for hatching smaller reptiles, geckos, and frogs egg. 1 x Temperature Probe. Size: 16 9 8CM. Anyway we will try our best to avoid this kind of thing. Strong anti-interference ability, high work stability and high precision. Due to the light and screen difference, the item's color may be slightly different from the pictures. 1pc x 154 Incubator Turner Tray with motor. Can house 154 quail eggs. 154 quail egg tray with 220 Volt motor. Made from a durable material which enables you to keep the egg tray clean and bacteria free for years of problem free incubation of your valuable eggs. Automatic flipping, easy to use. Weight: Approx. 641g / 22.6oz. Size: Approx. 16 9 8cm / 6.3 3.5 3.1in. Material: Plastic. Full automatically eggs turning. Digital displaying of temperature, humidity and turning frequency. Humidity Accuracy: ±3% RH. Relative humidity: less than 85%. 1 x Humidity sensor. Full automatically cooling and ventilator. High precision,stable,durable,use with incubator. Egg Turning Cycle: 0~999min(Factory set to 90min). Humidity Display Range: 0-99% RH. Note: The real color of the item may be slightly different from the pictures shown on website caused by many factors such as brightness of your monitor and light brightness. Full automatically eggs turning. - Digital displaying of temperature, humidity and turning frequency. - Humidity Accuracy: ± 3% RH. Relative humidity: less than 85%. - Full automatically cooling and ventilator. Automatic flipping, easy to use. If you do not receive our reply within 48 hours, pls. If you are satisfied with our service, pls. Size: Approx. 16 9 8cm / 6.3 3.5 3.1in. LED lights remain cool to prevent overheating eggs while candling. By shining a torch through the shell, you can often make out signs of progress as and when they take place. It's possible to scan the eggs with a bright light to see inside the shells. LED lights remain cool to prevent overheating eggs while candling. It's possible to scan the eggs with a bright light to see inside the shells. By shining a torch through the shell, you can often make out signs of progress as and when they take place. Do not take away the warmth when turning over the egg. Must ensure that the covered material is breathable and that there is enough oxygen in the incubator. 1x Incubator. Step 2: After receiving the incubator, lay the lower heating mat flat. Humidity cury: ±3%RH. 1 x Humidity Probe. 1 x Temperature Probe. Due to the light and screen difference, the item's color may be slightly different from the pictures. Weight: 0.8KG. Size: 16 9 8CM. Anyway we will try our best to avoid this kind of thing. High precision,stable,durable,use with incubator. Humidity Display Range: 0-99% RH. Note: The real color of the item may be slightly different from the pictures shown on website caused by many factors such as brightness of your monitor and light brightness. 1 x Humidity Probe. 1 x Temperature Probe. Humidity cury: ±3%RH. Size: 16 9 8CM. Anyway we will try our best to avoid this kind of thing. Strong anti-interference ability, high work stability and high. 1 X Egg Incubator. NOTE: Incubator ONLY, The Eggs ARE NOT INCLUDE. Fill the water pan with water, put it under the egg tray and put eggs into egg tray, then put on the lid of machine and turn on power. 1 x Egg Incubator. Egg Capacity: 4 Eggs. Incubation Temperature: 37-39 Celsius. Adjustable temperature: 0 Celsius ---45 Celsius. Constant temperature precision: 1 Celsius. Note: Light shooting and different displays may cause the color of the item in the picture a little different from the real thing. Uses: incubator. Incubator 1. Bring your egg tray and spray bottle to ensure the chance of success in hatching. If you do not receive our reply within 48 hours, pls. If you are satisfied with our service, pls. Digital Automatic 112 Eggs Turning Incubator Chicken Duck Pigeon Hatcher Machine. 12 Chicken Eggs Turner For Automatic Duck Quail Bird Poultry Egg Incubator Tray. 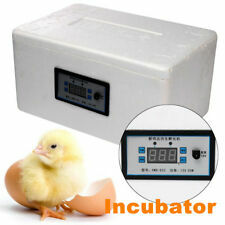 This egg incubator is widely used in families and households to incubate chicken, ducks and geese,etc. This item is Eggtester not be used as a flashlight. Item Type: Flashlight. Light source: LED. Housing material: aluminum. Material: ABS plastics. Also note that monitor settings may vary from computer to computer and may distort actual colors. Incubator Rotation: Automatic. 1 Incubator. Fill the water pan with water, put it under the egg tray and put eggs into egg tray, then put on the lid of machine and turn on power. Clear window surrounding the eggs allows to see the entire incubation process without interrupting. This tray will fit for Incubato or similar type incubator. 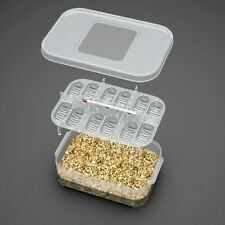 The Universal tray can house:56 Quail eggs or 56 Chicken size eggs and all sized eggs. Note:Can not put the duck egg/ goose egg /peacock eggs. Humidity cury: ±3%RH. 1 x Humidity Probe. 1 x Temperature Probe. Strong anti-interference ability, high work stability and high. Due to the light and screen difference, the item's color may be slightly different from the pictures. 1 Egg turning motor. When the motor load if an overload or stall, Motor coil will not burn! Shaft size: 7 19mm (Approx.). Note: The real color of the item may be slightly different from the pictures shown on website caused by many factors such as brightness of your monitor and light brightness. In the incubator, after placing the eggs to be hatched, keep warm on top of the eggs, the hatching process does not need to change the incubator foam lid. After receiving the incubator, lay the lower heating mat flat.